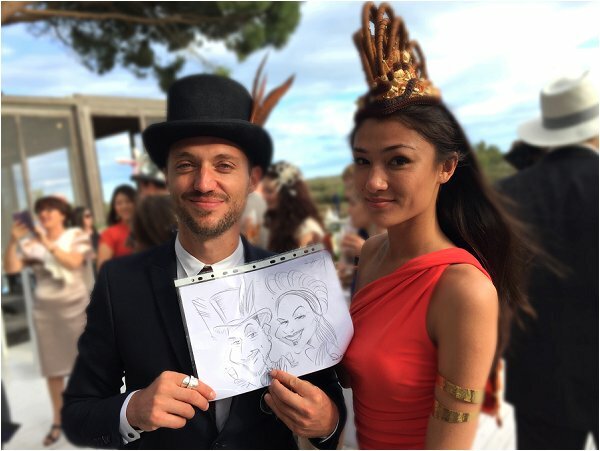 Would you have a wedding caricaturist as part of your wedding entertainment? 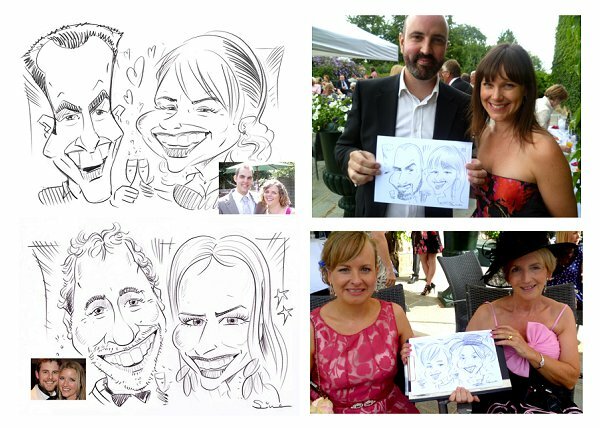 When it comes to entertaining your wedding guests there are so many options available, but would you consider a wedding caricaturist? 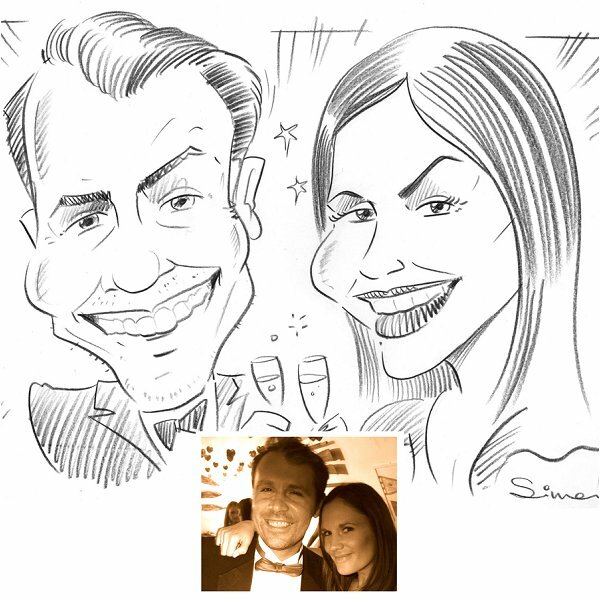 With the help of leading wedding caricaturist in France, Simon Roberts of Caricatures 4U, he is going to take us through exactly what is involved for having a caricaturist at your wedding and what it involves. We know personally for many weddings that we’ve attended over the years as guests, walkabout wedding entertainment tends to be a big hit. Simon himself does between 30-35 black and white A4 caricatures per hour and generally works for 2-3 hours either after the ceremony, or during the evening party, but the amount and when an artist will work, would be negotiated before the day. Also if the caricaturist works larger and in colour, these will of course take longer. 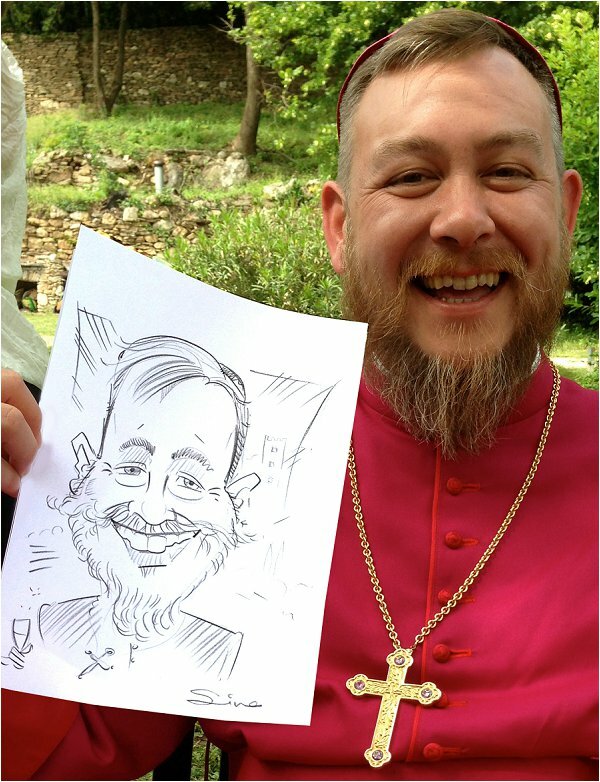 Simon says: ” I’m often asked why would I have a caricaturist at a wedding. Well, caricatures are such great ice-breakers at events. People love watching their friends being drawn and it works especially well during the drinks reception when the Bride and Groom are often busy with the official photographer. Many caricaturist work both daytime and evening during the wedding celebrations. In fact, sometimes a caricaturist will do an afternoon and an evening session. More frequently, especially here in France, weddings are celebrated over several days and you can have caricatures drawn at buffets and picnics held on either side of the actual wedding day. People can be worried that an artist will actually offend guests, and I have heard some stories from people who have been traumatized by a caricature done sometimes years ago. 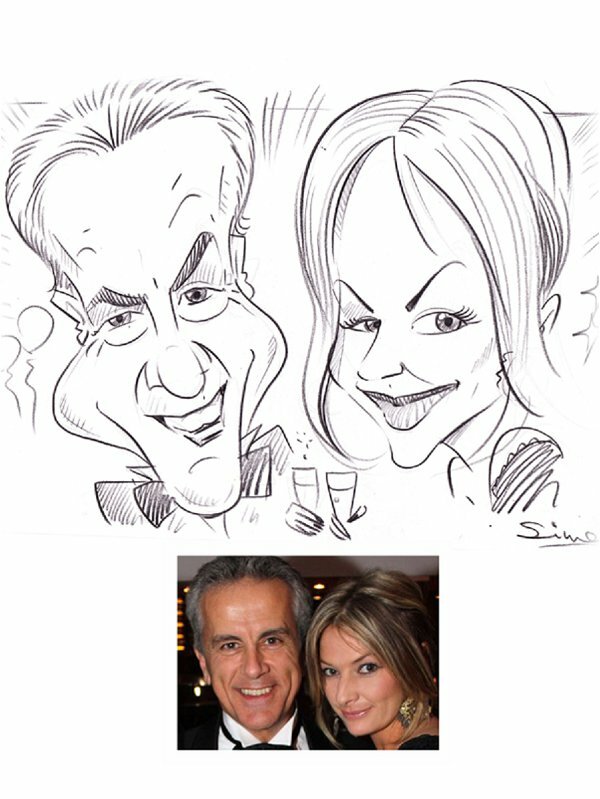 It’s always good to ask a caricaturist to do a sample caricature from one of your photos to check his or her style out. The cost for a caricaturist varies from caricaturist to caricaturist but generally a 3-hour session would cost between 375 – 475 euros. There would also be travelling expenses to add if the caricaturist has a long journey and needs to stop overnight in the area. And don’t only think of caricaturists only doing caricatures, as they tend to be artists like myself who can also be asked for watercolours. 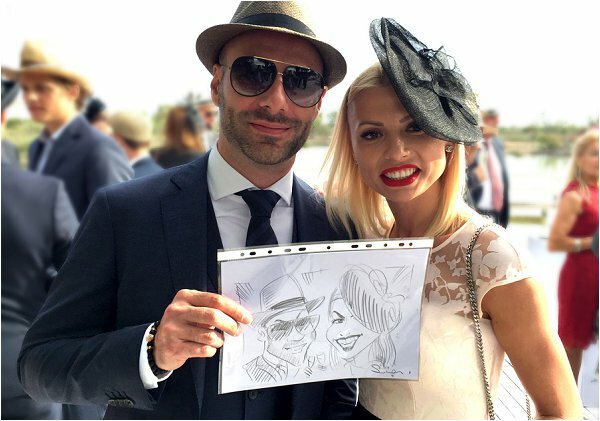 Some caricaturists may be able to do a group picture made up from pictures drawn on the day. 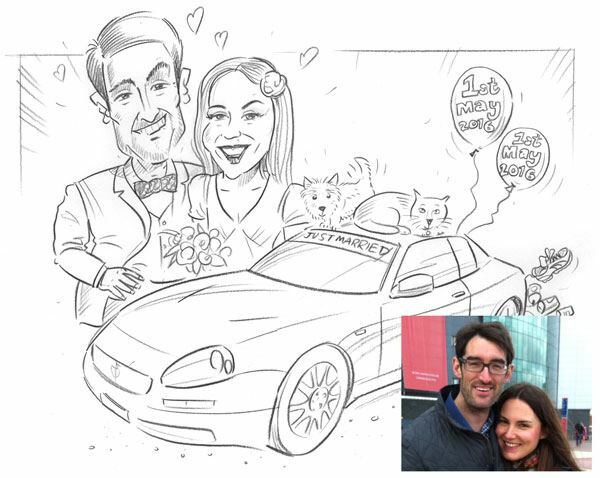 You’ll often find that a caricaturist has many artistic talents and can help in a variety of ways including wedding stationery designs, place settings and thank you cards and even perhaps an original painting of the wedding venue. 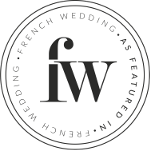 Simon Roberts is based in South of France and is available for weddings in the Languedoc Roussillon area of France and across Southern France. Check out Simon over on the French Wedding Directory or email him here to find out more information. I’ve seen this at weddings and parties and its so much fun. People love it. Plus artists give a great atmosphere. Its always a win.